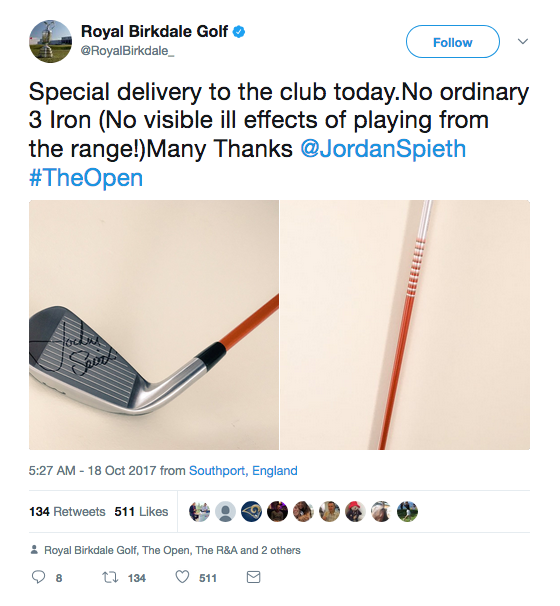 Because of course there is no club that better recalls Jordan Spieth's epic 2017 Open Championship win, even if he was not satisfied with his shot from Birkdale's range. It was the driving iron that took center stage and no one who watched the scene unfold will ever forget it. Since it's the club he used to hit the recovery setting up an epic unplayable lie-bogey and eventual win over Matt Kuchar, Spieth admirably donated it to Royal Birkdale. They received the club today, to go with their incredible clubhouse collection of memorabilia from past champions. The question remains, does Spieth's drop warrant a plaque? I say yes, even if only the driving range attendants will be the only ones who see it! One of the more insightful caddies in golf, John Wood was on Matt Kuchar's bag at the 2017 Open Championship, guiding the veteran to an epic performance. Since we only have a few hours left before the new PGA Tour season ends, Dan Kilbridge's Golfweek piece on Wood may amount to one of the few key season recaps. But it's a good one given Kuchar's play and Jordan Spieth's victory, which, if I had to choose, gets my vote for tournament of the year over Sergio winning the Masters. This was fun from Wood on the 13th hole delay Kuchar faced as Spieth attempted to take an unplayable lie drop. Kuchar and Wood waited nearly 20 minutes while Spieth and his caddie, Michael Greller, located Spieth’s errant tee shot and tried to figure out how to drop and play on. A big screen left of the fairway gave Wood a vague idea what was going on as they waited. He doesn’t recall any specific conversations during that time. Kuchar probably talked about his kids. Wood might have discussed a book he was reading. A bit of normalcy amid the chaos. For the first time the men's Open Championship edged the U.S. Open in a once unthinkable occrence. And while the 2017 KPMG LPGA was not a morning show, it also beat the U.S. Women's Open ratings. While the Ricoh Women's British Open had its moments and there may be a Michelle Wie bump, I.K. Kim still held a huge lead heading into the final round. Translation: not the recipe for ratings success. But are we seeing more evidence yet that sports and golf fans are preferring their golf in morning or prime time hours now that we learn the 2017 Women's British was the season's top rated broadcast? Remember, all of the events in question are network broadcasts (NBC or Fox), so this is not a cable vs. broadcast network story. And maybe there is no story yet, but the interest in morning golf is a trend worth noting. The RICOH Women’s British Open Final Round coverage on NBC yesterday posted a .86 Overnight (11:30 a.m. – 2:30 p.m. ET), +15% YOY, making it the highest-rated overnight telecast for women’s golf in more than a year (2016 U.S. Women’s Open; .98) and the highest-rated women’s golf telecast on NBC since 2014 U.S. Women’s Open (1.67). Final Round coverage, which saw I.K. Kim (South Korea) win her first major championship, also became the highest overnight rating at the event in more than 10 years (2006 on ABC; 1.30). This is the first time in the history of the Women’s British Open that it reigns as the highest-rated women’s golf telecast of the year, to date, despite its morning/early afternoon telecast window. The comparable final five hours of the RICOH Women’s British Open’s Final Round coverage across Golf Channel and NBC was a .64 (9:30 a.m. – 2:30 p.m. ET), which makes it the highest overnight rating for a women’s major 5-hour telecast in 2017 (FOX, U.S. Open Final Round, 2-7 p.m. ET; .63). And the comparable final three hours of broadcast television coverage makes the RICOH Women’s British Open the highest rated ( 11:30 a.m.-2:30 p.m. ET; .86), +21% vs. U.S. Women’s Open on FOX (4-7 p.m. ET; .71) and +25% vs. KPMG Women’s PGA Championship (3-6 p.m. ET, .69). Next up in women’s golf will be Golf Channel and NBC’s coverage of the Solheim Cup, the biennial team match play event featuring the United States vs. Europe, being contested in Des Moines, Iowa, Friday, August 18 – Sunday, August 20. Dave Shedloski with a fun GolfDigest.com account of Jordan Spieth's pre-WGC Bridgestone thoughts. It's rather apparent the possibility of a career Grand Slam is not weighing on him as much as clearing the air on that 13th hole tee shot at Birkdale. As for the pretty awful tee shot at Birkdale that got worse when it hit some poor person in the head and headed east of a dune prompting a 20-minute pause in the action? Spieth now says the hideousness of the shot has been blown out of proportion. He's hit worse. Ron Green Jr. writing for Global Golf Post. “I missed my right side of the fairway by 20 yards-ish and it hit the guy in the head and then went over the next mound. So essentially it was 20 yards offline. I hit balls further offline than that on a regular basis, but where it ended up and what it looked like compared to the fairway for viewership was way offline. He also discussed watching the final round with caddie Michael Greller. "Matt Kuchar comes to grips with coming up short"
As the 146th Open moves to our rear view mirror, I'm still thinking about the incredible play of Matt Kuchar. Having watched him more than any player during the week, I was struck by his consistency, touch and shrewd handling of Royal Birkdale. He deserved to win. And nothing against his signature wins at The Players and Memorial or his Olympic medal in Rio, but this was the tournament of his life. Tim Rosaforte at Golf World does a nice job summing up where this leaves Kuchar at this point in his career and in the coming years. Rather than sulk about his near miss, Kuchar did what he always does. He moved on, honoring his commitment to play in this week’s tour stop at Glen Abbey (he is sponsored by RBC). He shot an opening-round 71 on Thursday, though afterward, he said he felt dizzy during the day, even seeking medical help during the round. Unclear what caused the faintness, Kuchar was optimistic it was just temporary. He could have easily withdrawn from the tournament given the circumstances, but instead he followed it with a Friday 68, an impressive round in which he played the last six holes in five under, with an eagle and three closing birdies to make the cut. There will be more big events in the coming weeks, the PGA Championship on the horizon and the FedEx Cup playoffs again looming. Friends and family have reminded Kuchar there are plenty of positives to take from Birkdale. So it is that he is trying to look at it the way Superman would, the way a bronze medalist would. I wrote about the zaniness at 13 Sunday at Birkdale for Golfweek, and while most are pretty satisfied with the conclusion, many have written in response to the piece still unsatisfied with how things played out. Namely, many are upset at the time Jordan Spieth's drop took and the impact on Matt Kuchar. Some are still upset that the driving range was not marked as out-of-bounds. And some are unhappy that Spieth could hit such a poor drive and use the rules to his advantage. - Spieth's tee shot ended up on the side of a huge dune almost 100 yards from the fairway. The ball hit a spectator. The combination of visibility issues and simply maneuvering on a steep, wet hill made it hard for anyone to move quickly or figure out options. - The range was too far out of play to be seen as a necessary boundary. Sure, the 10th fairway was declared out of bounds on Tuesday of tournament week to prevent 350 yard short cuts, so it certainly could have been declared OB in the same way. But I just don't think anyone could fathom the range being in play. - As soon as Spieth saw how bad the lie was, he had the clarity to start looking at unplayable lie options, briefly at the base of the dune and then going as far back as he wanted, keeping the ball in line with the hole. He had to move back up the dune to sort out the line with the walking referee. That took a while. - Spieth should not be blamed for the tour trucks having not left town. Nor is it his fault that the range was left unmarked as a boundary. - Apparently not seen on the American broadcast was Spieth's drop between the tour trucks, which took a few minutes to sort out and was ultimately resolved by John Paramor, roving official and European Tour rules man. Once he was on the scene things moved along. - In watching Spieth and Greller work, I actually sensed Jordan might have rushed the shot once he got his line of play and the crowd somewhat settled down. He did not strike it perfectly and from his vantage point, the shot seemed way right. But as Bones noted today on Morning Drive, Greller's yardage call was a great guess. Oh, and rangefinder advocates, a distance measuring device would not have sped things up much or looked very good. - Jack Nicklaus was impressed with how Spieth used the rules to his advantage. And while it did take him a long time between the tee shot and the next shot, Jordan figured out what to do. I don’t know if I would have figured out to go over to the driving range for that shot. That was an unbelievable decision and unbelievable 5. That putt was so huge. - Spieth joked afterwards about having experience with unplayable lie drops and temporary movable obstructions. That may be the case, but as Karen Crouse notes in this comparison between Spieth and McIlroy, he's also just the more analytical player. His nearly-manic energy at times came in handy. - The entire scene was terribly unfair to Kuchar but not avoidable. - The distraction of dealing with the situation might have weighed on someone who was already pondering a major meltdown (Coffin/GolfChannel.com). Spieth turned chaos into a positive. Again, lousy for Kuchar but it could have all easily gone another way. Spieth is just a different character. At least he apologized for taking so long. A YouTube posting of the entire sequence is here. There is a lot of great insight here from The Scotsman's Martin Dempster talking to Jordan Spieth caddie Michael Greller. Spieth credited his bagman with helping turn things around and Greller, who rare gives in depth interviews, was more open about this one. “I just told him to go back to the tempo of the Travelers because it was really similar,” said Greller of the PGA Tour win recorded by Spieth in his previous outing before the season’s third major. “He was leading wire-to-wire and was having some tough things happening. It just so happens this was a major. He knows what to do. This was the 13th time he’s had the lead in a major, so it’s not like this was his first time in this situation. He was easy to work with. He’s matured a lot in the last six years since I met him. It wasn’t that difficult. Spieth now famously also gave Greller a new task, picking the ball out of the hole after seeing players do that in old Open highlight films. Kevin Casey with the roundup on that. The clubs and yardages from @JordanSpieth's win, with a special note. SBD's Austin Karp shared some overnight ratings for Jordan Spieth's win at The Open and for the first time, it may exceed the U.S. Open in total viewership. On the sports side, the final round of the 2017 Open Championship on Golf Channel and NBC drove and putted its way to 433,000 total interactions across Facebook and Twitter. SOUTHPORT, ENGLAND (July 25, 2017) – NBC Sports Group’s comprehensive coverage of Jordan Spieth’s dramatic victory at The 146TH Open concluded Sunday with a Total Audience Delivery (TAD) of 4.97 million average viewers across NBC and NBC Sports Digital, as well as a 3.2 U.S. household rating (9:14 a.m.-2:08 p.m. ET), according to Nielsen Fast Nationals. The 4.97 million TAD for The Open at England’s Royal Birkdale Golf Club was +1% vs. 2016 at Scotland’s Royal Troon (4.94 million TAD), with a combination of 4.91 million average TV viewers on NBC (Even vs. 2016) and 59,200 streaming average minute audience (37,592 average minute audience, +60% vs. ‘16) across NBC Sports’ streaming platforms. TAD measures consumption across multiple platforms, combining the Average Minute Audience (AMA) for television and digital. This makes 2017 the most-watched telecast of The Open since the 2009 Final Round at Turnberry on ABC (5.55 million), which ended in a 4-hole playoff with Stewart Cink defeating a 59-year-old Tom Watson. TV-only viewership on Sunday peaked with 7.33 million average viewers (1:15-1:30 p.m.) as Jordan Spieth clinched the Claret Jug with his winning putt, making him the Champion Golfer of the Year. Across all four days, The Open totaled 100.8 million live minutes of streaming, a record for an NBC Sports’ golf event, and a remarkable +96% vs. ‘16. Streaming also garnered 917,000 unique devices (+51% vs. ‘16) and an Average Minute Audience of 34,000 (+92% vs. ‘16) across 50 hours of coverage. Sunday’s Final Round garnered 20 million minutes of live streaming (+60% vs. ‘16), 300,000 unique devices (+19% vs. ‘16). · NBC's Final Round telecast is the only major championship with a final round viewership increase vs. 2016 year-to-date and is the most-watched golf telecast on NBC since Tiger Woods’ win in the final round of the 2015 Players (5.07 million). · The 3.2 rating for NBC’s 2017 coverage of daytime finish of The Open is +4% vs. 2017 U.S. Open Final Round’s primetime finish on FOX (3.1 U.S. Household Rating). · NBC’s Third Round coverage (3.11 million TAD) is the most-watched Saturday golf telecast on NBC since Saturday of the 2016 Ryder Cup (3.33 million TAD, 9 a.m.-7:17 p.m., Oct 1). · On Thursday with coverage of The Open’s First Round, Golf Channel was the #1 cable sports network by 135% and #7 out of all 114 Nielsen rated cable networks from 8 a.m.-4 p.m.
· On Friday with coverage of The Open’s Second Round, Golf Channel was the #1 cable sports network by 344% and #5 out of all 114 Nielsen-rated cable networks from 8 a.m.-4 p.m.
· The Open was the #1 sports telecast of the day on Friday by 46%. 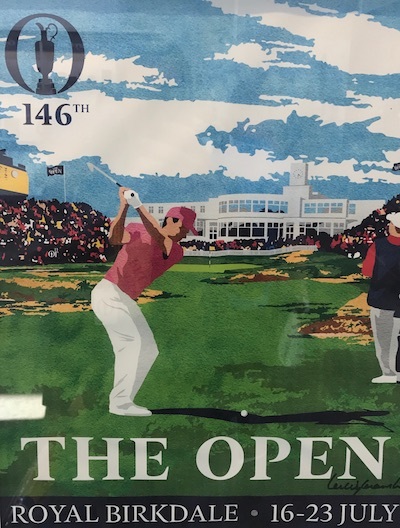 · Golf Channel on Friday from The Open posted its most-watched day (567k average viewers) since Ryder Cup Friday in September 2016 and the network’s 4th most-watched day ever. First 2017 Open Championship Question And Poll: Should Royal Birkdale Host More Regularly? As I write here for Golfweek, Royal Birkdale is a course for horses. It regular produces great finishes and stellar champions. The players love the place. Several, including hometown hero Tommy Fleetwood, suggested that once ever 9-10 years is not enough. The crowds broke records. They were passionate but respectful and incredibly welcoming. Having seen Hoylake, Lytham and Birkdale in recent years, I wouldn't mind seeing Birkdale permanently replace Lytham in the Merseyside rota-within-the-rota. Should Royal Birkdale host The Open more regularly? I'll have a longer recap here and a ShackHouse will be posted tonight. In the meantime, Golfweek's quick recap and my story on the 13th hole chaos as a lucky eyewitness. Another stellar day at Royal Birkdale gave us some history, mostly incredible play and a few setbacks for stars. Mostly though it was another impressive display by Jordan Spieth and Matt Kuchar who head into the finale well separate of the field. Here is the roundup on Branden Grace's historic 62 from yesterday. A week ago, the firmness of the fairways, as measured by something called the Clegg Hammer Test, measured about 130. (Drop a golf ball from shoulder height on a 130 CHT fairway and you will hear a dull thud and see the ball bounce.) By Thursday, the Royal Birkdale fairways were Clegging around 115. Not mushy—let us stand in praise of sandy soil!—but not exactly linoleum, either. John Huggan wonders if the R&A made the setup too reasonable will welcome discussion of the low scoring (GolfDigest.com). In order to achieve all of the above, they have deliberately allowed the game’s best almost free rein. They have collectively gritted their teeth and actively encouraged low scoring the like of which we haven’t seen before at Royal Birkdale. And, in doing so, they hope to encourage growing and widespread calls for change in the long-established debate over distance. No easy task, of course. But it can safely be assumed that the R&A and their American counterparts at the USGA would welcome such discussions. Johnny Miller's assessment of the setup hasn't gone over well with the younger set (Kerr-Dineen/For The Win). Doug Ferguson with this piece from a few weeks ago where Jordan Spieth spoke of being uncomfortable in the leading role and hoping to change that. Jaime Diaz wonders if Spieth will put some final round Masters demons behind him and suggests by that deep stare Spieth gave upon birdieing the 18th yesterday if we'll be on career Grand Slam watch next month. Final round tee and TV Times (Casey/Golfweek). The weather forecast suggests the most wind will be late in the day. Peter Kostis shot back at Dan Jenkins to defend his CBS colleague Ian Baker Finch. TheOpen.com for all of your basic needs. The traditional leaderboard at TheOpen.com. I'm not sure if it works in the States, but Open radio is a fun way to enjoy the action if you have other tasks to tend to. Inexplicably, the R&A no longer sells radios to spectators. Golfweek's Live Blog will keep you up to date. The Guardian's Live Blog will give you the UK perspective. He made it look pretty easy on a day that was admittedly asking for a 62 at Royal Birkdale. Bones Mackay even predicted it, with apologies, to Johnny Miller. I stepped out to the course to watch the last part of the historic round and filed this for Golfweek.com on the round, Grace not having a clue where he stood to par or even the historic nature. Here is the hole-by-hole info on clubs used, provided by caddie Zack Rasego to R&A media liason Dave Seanor and posted here at Golfweek.com. Note that he did not hit more than a 7-iron into a par-4. Here is a picture of the official scorecard for history buffs. Johnny Miller's reaction from the NBC telecast on the accomplishment. Steve DiMeglio calls Royal Birkdale defenseless in his USA Today assessment. Derek Lawrenson in the Daily Mail: "A significant milestone in the history of the game was shattered on Saturday by a South African who had no idea of the enormity of his achievement." Jason Sobel equates it to breaking golf's version of the 4-minute mile. And maybe the most important factor, considering how many times the golf gods have kept the 62nd stroke out of the hole in a major – it was about damn time. Josh Berhow at Golf.com captures some of the majestic home hole scene as Grace finished the historic round. The social media congratulations are pouring in, starting with Jack Nicklaus. GolfChannel.com with the roundup. Grace's bag, reported on by David Dusek. Stenson's 63 was 9.8 strokes better than field average that day. Thomas' 63 was 9.0 better. Grace's 62 is currently 6.7 better than field. Eric Matuszewski talks to Tommy Roy about The Golf Channel/NBC approach, including the split screen breaks we've seen so far. The "Amber" weather alert that halted play for 15 minutes is explained here by the Met Office. Friday's notes, quotes and shots of the day (Ahern/Golfweek). 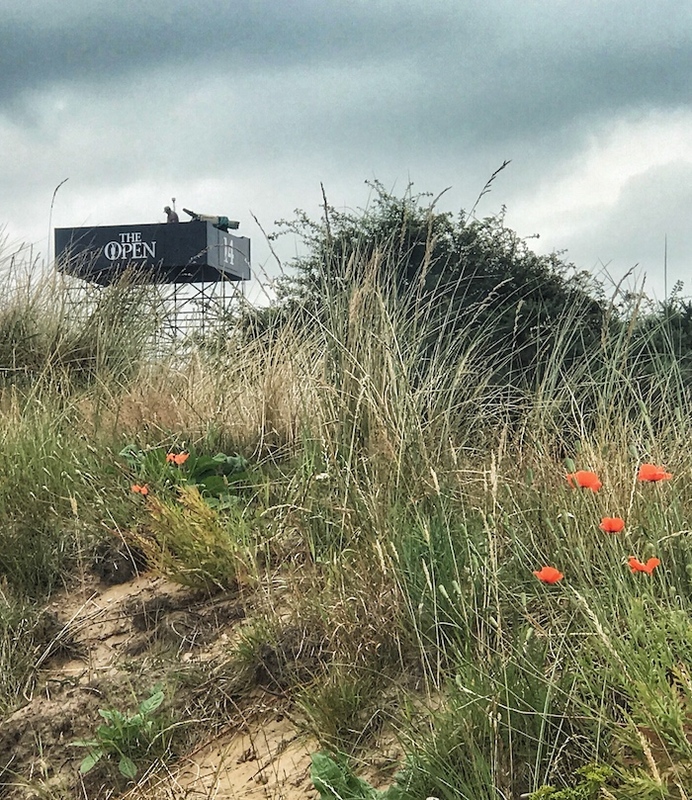 It was an above average day at Royal Birkdale in terms of scoring, storylines, shotmaking and a course in peak condition. Day two may not be such a graceful display if the forecasters are to be believed. Alfie Plant displayed no fear. England's least known, best hope at the moment. To kick off round two, the R&A announced Andrew Johnston as "Beef" Johnston. Somewhere Ivor Robson just flinched. Having inspired several other clubhouses and several homes in the neighborhood, the Royal Birkdale clubhouse influence is unmistakable. Though as David Owen noted in this piece, with accompanying image, the original design vision was pretty swell and needs restoration. These days, the exterior just lacks a few too many of the fun nuances that articulated the original vision and yet I still love the concept and the vision. We started it out with positively hideous weather but things have improved notwithstanding a huge drop in temperature compared to the practice rounds. TheOpen.com for all of your needs. I'm not sure if it works in the States, but Open radio is a fun way to enjoy the action if you have other tasks to tend to. Justin Thomas has stuck to the expected scripting and his cardigan/tie combo is definitely classing this place up. Round one hole locations at Royal Birkdale appear mostly generous. After yesterday's press conference where he acknowledged movements in driving distance averages, R&A Chief Executive Martin Slumbers opened the door to rules bifurcation. Slumbers seems to see the wisdom in letting average golfers enjoy the benefits of technology while making changes to maintain skill in the elite game. Even considering another set of rules for the elite game is a milestone moment for the R&A. The organization has resisted such a concept, even when the notion was suggested to deal with anchoring. Couple this with the USGA's Mike Davis suggesting a variable distance ball concept as a possibility and we appear to be on the road to bifurcation. After the bleak forecast almost was proven wrong, an afternoon storm dropped some moisture on the firm fairways of Royal Birkdale. The weather forecast remains bleak unless you like to see wind and rain. "You can play as safe as you want, but then your next shot is that much tougher to the green,'' said Bill Haas, whose tie for ninth last year at Royal Troon was his best Open finish. "Can you compete by hitting short irons off tees? Yes. But I remember Louis Oosthuizen when he won at St. Andrews [in 2010]. He hit driver everywhere. Just piped it. He hit sand wedge into every hole. No wonder he won. Brandt Snedeker has withdrawn from The Open with a rib injury. James Hahn gets in. Brian Wacker on Paul Casey's cycling preparation and contentment with his life. The players are noticing the bunker difficulty, namely the heavy sand and potential for awkward stances. Brentley Romine with the social media round-up. The R&A press conference elicited a few bits of news. Drug testing is in, reviewing the anchoring ban is not. Bradley Klein takes you hole by hole at Royal Birkdale. David Dusek on the emergence of driving irons this week. Driving irons used to be fairly standard on the PGA Tour, but they started to vanish in the 1980s. The popularization of hybrids in the 1990s and 2000s pretty much were the nail in the coffin for 1-irons and 2-irons. And as clubs and balls improved with technology – and lofts became stronger on iron sets – strong players were hitting their 3- and 4-irons as far as the previous generations hit 1-irons, anyway. Maverick McNealy says his game is trending in the right direction and he's likely turning pro later this year, Ryan Lavner writes. Rory McIlroy made anintriguing remark in his press room interview today, Jeff Babineau notes in his Golfweek story considering McIlroy's chances. If you'd like a little history, Michael Bamberger considers the influence Arnold Palmer's 1961 win here had on The Open. I filed this Golfweek.com piece on The Artisans and their fourth green clubhouse. Nothing like clubs within a club! This Todd Lewis helmed live piece offered a rare look inside the Birkdale clubhouse. Really cool stuff! And one more reminder for US viewers, all of your telecast times here starting with Wednesday's Midnight Drive at 9 pm PT and leading into Open coverage that commences for 14.5 hours at 10:30 pm PT. Nice to ask a distance question and not get the usual suggestion that things have leveled off, but maybe R&A Chief Martin Slumbers knew after this year's U.S. Open's driving distances that such a stance would not fly. From today's R&A press conference at the 146th Open Championship. Q. Several of the players have noted that they are hitting very few drivers. Some players may not even have driver in their bag. In the context of the statement of principles from 2003 regarding skill, does it concern you that that club is not a factor this week because of the distance the players hit the ball? MARTIN SLUMBERS: Well, you can look at it two ways, the golf course is set up 17 yards shorter than it was played in '08. The great thing about links golf, as many of you know, if you're as much an aficionado of this game as I am, course management is one of the most important things about links golf. It's pretty firm out there. It's running hard. The rough, if you run out in the wrong direction, can be pretty penal. And certainly the conversations I've had with players is that they are really enjoying the challenge of trying to work at how to get the ball in the right place. And at times that will lead them to hit irons as against drivers or woods. I think Phil was talking yesterday about maybe not putting a driver in the bag, and I think we'll see quite a few irons, especially if the wind stays in the quadrant that it's in in the moment. The broader question on distance that you raise is we are very -- I spend a lot of my time and the R&A's time looking at distance. We are very focused on setting it up in two ways, one is around transparency, which is what we did two years ago - started to take the PGA data and take the European Tour data, put it together and publish that. Some people don't like that. Others say it's great to have the numbers. The second thing that I'm looking at and spend probably as much time doing it is this balance between skill and technology, and whether how much the technology and skill, are they in balance, is it good for the recreational game? Is it the same for the elite game? And those two issues are what we are looking at at the moment. And if you look at the data over the last 18 months, we are seeing this year movements, only halfway through the year. We will take a full look at the end of the year, and then come back and make sure we analyse and think about it very carefully.